An “Iowa Poll” released this weekend by The Des Moines Register shows Governor Chet Culver faces an uphill battle in his bid for reelection next year. Only 40 percent of the Iowa voters surveyed last week said they approve of Culver’s job performance. The newspaper’s pollster also matched Culver, a Democrat, against two potential Republican rivals, and those who were surveyed favored both Terry Branstad and Bob Vander Plaats over Culver. Culver is running campaign ads on television which tout his management of state government. 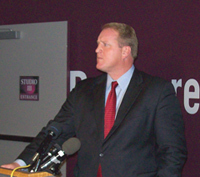 In public appearances, Culver vows not to raise taxes and he promises to make even deeper cuts in state government. Culver cites the report’s other conclusion, that Iowa is among three U.S. states which are “least like” California. Five states scored an A or an A- in the Pew Center’s report. Along with Iowa, seven other states scored a B+. The “Iowa Poll” taken last week found just 34 percent of those surveyed believe the state of Iowa is headed in the right direction.